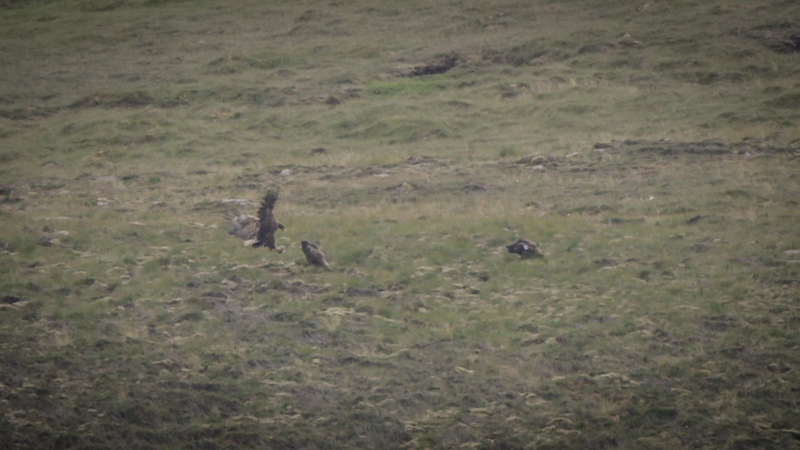 The two white-tailed eagle chicks that hatched in Hoy in May, have successfully fledged, RSPB Scotland announced today. They are the first young white-tailed eagles to take to the Orkney skies in 145 years. The discovery was made by two RSPB Scotland volunteers, Katharine Stark and Janet Yeung, when they spotted both chicks in flight as they arrived in Hoy for Wednesday’s Eaglewatch – an event that has been running every day to help locals and visitors enjoy seeing the birds. Katharine commented, ‘It was magnificent to see the eagles soaring through the sky, especially knowing how long it has been since the last time. We spoke to lots of locals and tourists throughout the day and everyone was thrilled. There has been a nervous excitement in the air since the chicks hatched but now we can all breathe a sigh of relief and celebrate.‘. This remarkable conservation success story is made even more special as 2018 marks the 100-year anniversary since white-tailed eagles became extinct in the UK when the last known bird was shot in Shetland in 1918. Two formal reintroductions, releasing a total of 140 birds, were carried out on Rum (1975-1985) and Wester Ross (1993-1998). They first bred successfully on Mull in 1985 and have since gone on to establish an increasing breeding population on the west coast of Scotland. A third re-introduction phase of 85 of birds on the east coast of Scotland between 2007 and 2012, aimed to help make the Scottish sea eagle population stronger, and allow them to re-establish across the country much sooner. In 2013, white-tailed eagles bred in east Scotland for the first time in 200 years. The reintroduction was achieved thanks to many partners, primarily RSPB Scotland, Scottish Natural heritage, Forestry Commission Scotland and the Scottish Government with the greatly appreciated assistance of farmers, landowners, private forestry and the people and the Government of Norway who donated the original chicks. There are now more than 100 breeding pairs of the UK’s largest bird of prey in Scotland. Although white-tailed eagles have bred successfully and broadened their range, they were absent from Orkney until an adult pair first appeared in 2013. It is not known whether the Hoy birds came from the Scottish mainland or if they travelled from Scandinavia. Their arrival led to unsuccessful breeding attempts in 2015 and 2016, before the pair abandoned the territory in 2017. However, the female returned this year with a new, younger male. Hopes were high when the adults showed signs of incubating, and confirmation was later made of a chick on the nest. This marked the first eagle chick hatching in Orkney for 145 years. In the weeks since, it became apparent that there were two chicks, as both became increasingly visible in their nest on the Dwarfie Hamars. White-tailed eagles are the UK’s largest bird of prey, with a wingspan of up to 2.5 metres. They have long been a part of Orkney’s history, with evidence of their bones being buried alongside humans as far back as 5000 years ago. Ian McNab, Events and Communications Officer for RSPB Scotland, said, ‘We were expecting them to stay in the nest for another week or two, as their first flight was from a precariously high cliff. However, both chicks are looking strong as they made their way up and beyond the Hamars. It’s quite common for birds of prey to stay within the territory for a while after they have fledged, so hopefully we will be able to enjoy watching them for some time yet.‘. 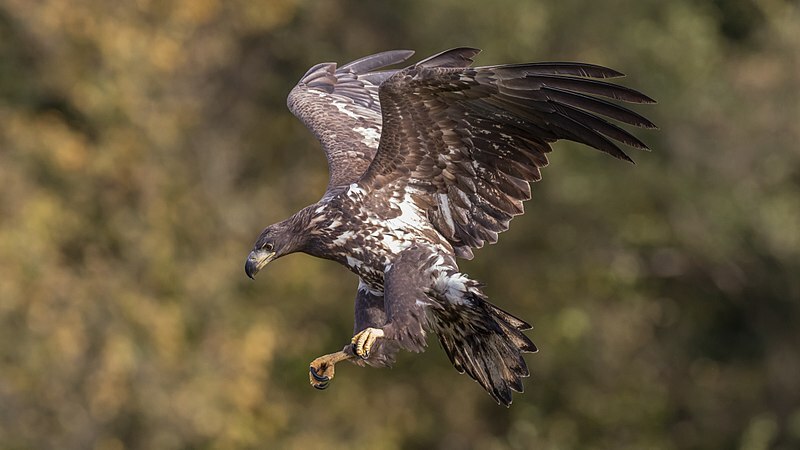 RSPB Scotland runs Eaglewatch every day between 11am – 4pm in the Dwarfie Stone car park, giving visitors the chance to see and learn more about the eagles. Great news. Well done RSPB and everyone involved - organisations and landowners, volunteers etc. A real good news story. Shame we weren't allowed by a small number of folk with vested interests to have them in England--- another case of NE having no bottle? No breeding pair on the east coast of Scotland this year. That phase of the reintroduce is looking seriously precarious and on the brink.